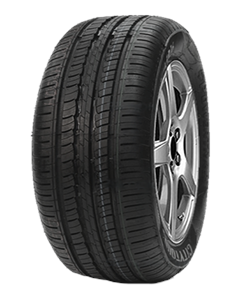 Four wide circumferential tread grooves deliver the ride stability and offer excellent performance on wet conditions. Improved grooves and bead profile design offer better ride stability, endurance and handling performance. Continuous tread blocks on both shoulder give great support to enhance the stability when cornering, the closed shoulders deliver excellent quiet ride. Continuous solid center rib sand lateral tread blocks connected by rib-in-chain enhance steering stability, decrease block deformation and reduce energy loss. Special tread compound delivers excellent grip on both dry and wet roads and offer longer mileage.